GE’s new CEO just bought $2.2 million of stock. Should investors follow his lead or is this insider buy just PR? General Electric (GE), once the bluest of blue-chip stocks, has fallen hard. Since the end of 2016, GE’s market cap has dropped by 70% — from $277 billion to $83 billion. In June GE was dropped from the Dow Jones Industrial Average after more than a century. The stock now trades at $9.30, down nearly 50% year-to date. Gordon Haskett analyst John Inch, who has been bearish — and right — about GE for a long time, believes the stock has further to fall. In a note, Inch said: “On a free cash basis, and assuming that GE Capital does not ultimately face insolvency, we estimate GE could trade for [about] $5 [a] share.” Scary stuff – who wants to step in front of a freight train barreling downhill? But then during market hours on Monday, November 5, GE’s new CEO Larry Culp filed a Form 4 with the SEC disclosing a Nov. 1 225,000 share purchase of his company’s stock at an average price of $9.73. That’s nearly $2.2 million dollars out of the CEO’s pocket betting that a GE turnaround will happen. On the surface, it’s a no brainer – the guy putting his hard-earned money at risk has more credibility. If analyst John Inch is wrong, and GE rises to $15 in the months ahead, he keeps his job, and finds other companies to analyze. 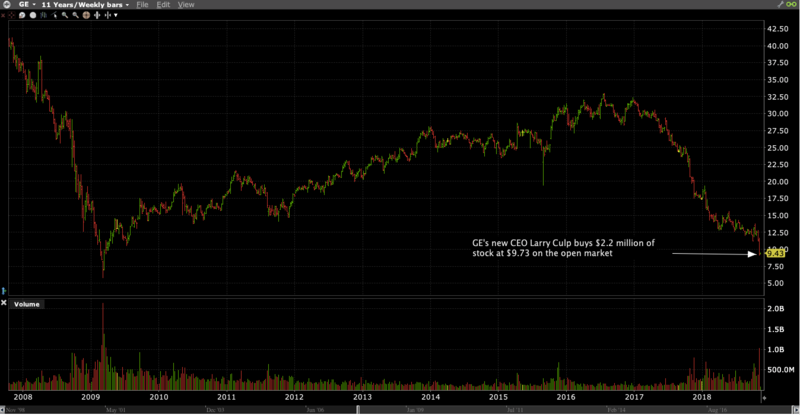 On the other hand, if GE does fall to $5, CEO Culp will be out a million bucks. That’s not chump change. Or is it? According to CNBC, Culp receiving from GE a “compensation package of up to $21 million a year in salary, bonuses and stock for the next four years, including a salary of $2.5 million, a bonus of about $3.75 million and equity awards valued at $15 million.” So, by buying $2.2 million of GE stock on the open market, Culp is investing 9.5% of this year’s compensation in his company’s shares. That’s real money; however, relative to his compensation, Culp’s not “all-in” with his GE bet by any means. 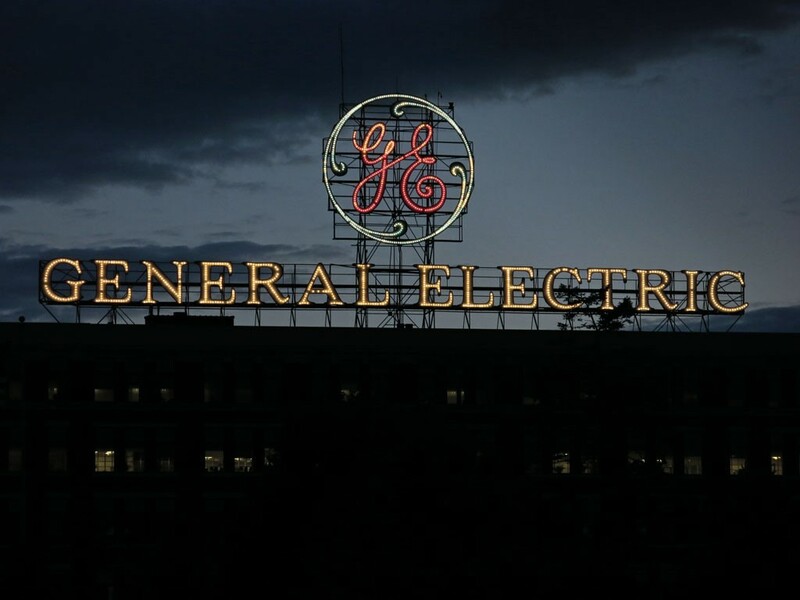 Its likely Culp’s insider buy has an additional purpose – to shore up investor confidence in GE, which has been badly shaken. One might rather follow an insider into a trade if he or she was placing a very large bet relative to compensation or net worth. Still, Culp’s buy is nothing to sneer at. Possibly other insiders and institutional investors will soon join him in accumulating GE shares. This academic paper studied the informativeness of insider trades and analyst recommendations. One of the conclusions the researchers reached was that: “insider trading is informative when signaling positive information, and analyst recommendations are informative when conveying negative information.” In other words, insiders tend to be right when they buy, but analysts’ buy recommendations typically aren’t informative. Likewise, insider selling isn’t predictive, but analyst sell recommendations may be worth paying attention to. Right now with GE, both the analyst and the insider seem credible. The insider buy “anomaly” has been studied extensively over the years, as academics have tried to explain why insiders who buy tend to outperform the market. One of the explanations ventured is that insiders are value investors, and as such tend to buy when stocks fall. While the insiders may have superior information, it’s also likely that by buying weakness, insider’s profit from the “mean-version” bounce, as weak share prices rise back to the mean. The thinking is that bad news causes stock prices to overreact, as investors panic-sell. However, over time, this overreaction is corrected as investors reassess the fundamental value of the stock. That could very well be the case with GE. Once the dust settles on this most recent decline, the former bellwether may be set-up for a very nice bounce. It’s worth noting that GE stock bottomed around $7 during the financial crisis. Buyers at those levels nearly tripled their money over the next year. Might history repeat itself?